When interviewing a new-hire candidate or posting a job listing, sharing a preview of the benefits your company offers can be the thing that helps your company stand apart from the crowd. 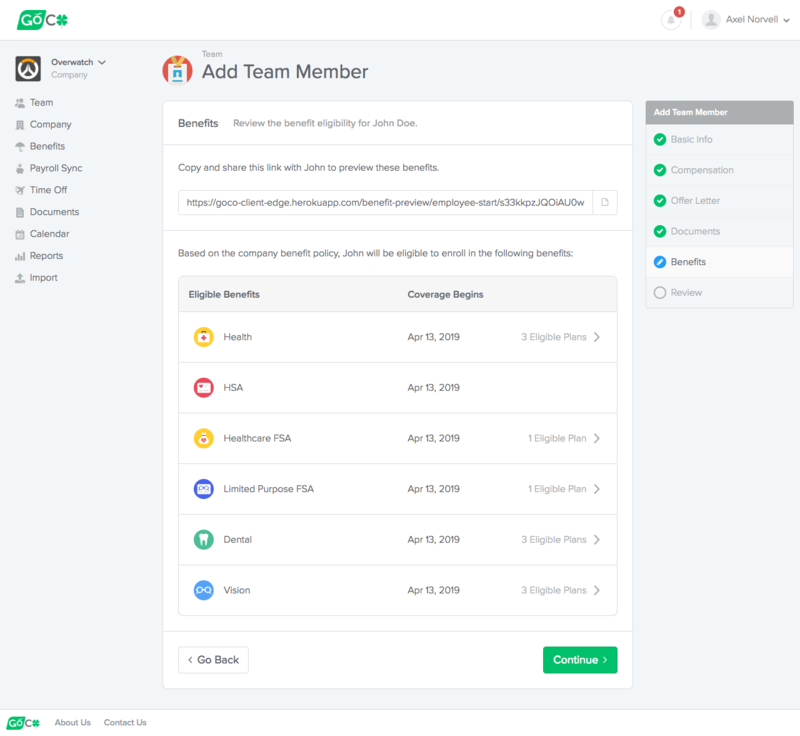 With GoCo’s Benefit Preview Links, sharing what benefits your company offers to new-hire candidates is easy! 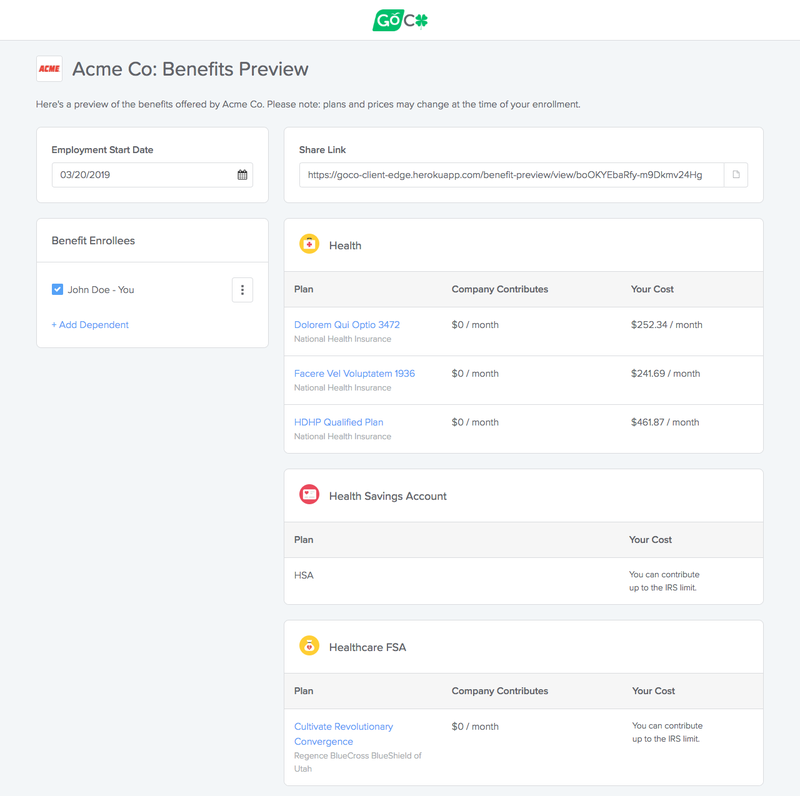 There’s two different ways you can create a Benefit Preview Link. Sometimes you may want to just include a link in a job board for a specific role you’re hiring for. GoCo lets you create as many of these preview links as you’d like! For example, you can create a link for “Engineering” new-hires, and another one of “Sales” new-hires and include these links in their respective job listings! Candidates that click on the link will be asked to enter some basic information, and be able to preview the benefits and estimated costs offered by your company right away! In this case, you might already know the employment details of the new-hire, and you’d like to share a benefit preview based on their actual employment info. To do this, simply start by adding a new employee in GoCo. When you get to the benefits step, there will be a link you can copy and share with your new-hire candidate. The candidate will be able to preview their benefit eligibility and costs based on the employment info you entered during the hiring process! 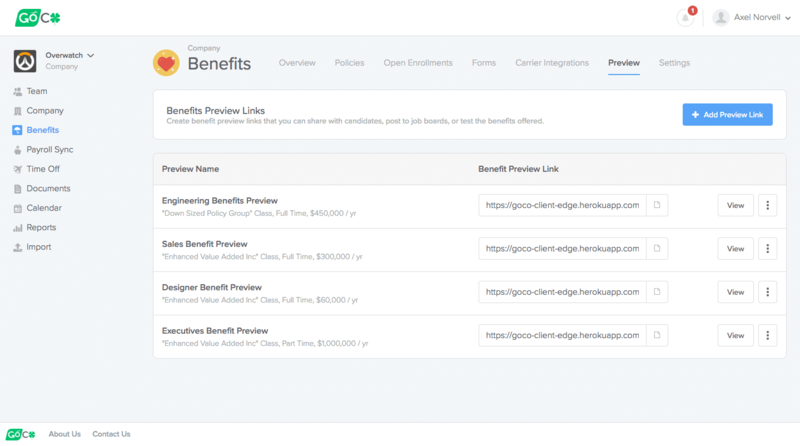 When hiring a new employee, you can copy a benefit preview link created just for them! Start sharing your company’s benefits! ← Previous PostReintroducing Magic Docs!